I don't always agree with Ms. Smith's takes on the poems in the intros, but she is always thought provoking, and I appreciate the exposure to new poets. Today's poem is Night Surrender by Leila Ortiz. Today's poem is Storm by Tina Chang. Today's poem is I Watch Her Eat the Apple by Natalie Diaz. Today's poem is Parable of a Firstborn by Rebecca Morgan Frank. Today's poem is Muse by Loretta Collins Klobah. Today's poem is Trans Is Against Nostalgia by Taylor Johnson. Today's poem is Introduction to Patriarchy by Chelsea Rathburn. Today's poem is Utsuroi by Lee Ann Roripaugh. Today's poem is Listen by Didi Jackson. Today's poem is The Unwritten by W.S. Merwin. Today's poem is Waking Up by Thomas James. Today's poem is If They Come for Us by Fatimah Asghar. Today's poem is Bat by D.H. Lawrence. Today's poem is Naomi by Tjawangwa Dema. Today's poem is On the Death of WWE Professional Wrestler Chyna by Hala Alyan. Today's poem is On Days When We Both Travel by Brenda Hillman. Today's poem is The Line-Up by Joan Swift. Today's poem is Out of Some Other Paradise by Alex Dimitrov. Today's poem is Still Life with Little Brother by Joshua Bennett. Today's poem is Kosmos by Walt Whitman. Today's poem is Wind by James Fenton. Today's poem is supply and demand by Evie Shockley. Today's poem is Europe by Kiki Petrosino. Today's poem is Coming Out by Iliana Rocha. Today's poem is The Singing School by Eloise Klein Healy. Today's poem is In Memory of Shame by Karenne Wood. Today's poem is Name That Means Holy in Greek by Kim Addonzio. Today's poem is America (peaches) by Kathleen Graber. Today's poem is Dancing in Buses by Javier Zamora. Today's poem is Boy in Park by Laura Kasischke. Today's poem is Gizzard Song by Dean Young. Today's poem is The Mystical Rose by Adelia Prado. Today's poem is Dear P. by Victoria Chang. Today's poem is The View by Tim Seibles. Today's poem is Elegy for Smoking by Patrick Phillips. Today's poem is The Emperor's Deer by Kamilah Aisha Moon. Today's poem is Origin Stories by Safia Elhillo. Today's poem is Swatting Flies by Austin Smith. Today's poem is Black is Beautiful by Monica A. Hand. Today's poem is Flesh by Yi Lei. Today's episode Sweeping the States by Jacob Saenz. Today's poem is Kettling by January Gill O'Neil. Today's poem is Walking Home by Jay Udall. Today's poem is Ode to the Pager by Marcus Jackson. Today's poem is To My Twenty-Four-Year-Old Self by Brenda Shaughnessy. Today's poem is Quiet Places by Lemn Sissay. Today's poem is Speaking Tree by Joy Harjo. Today's poem is Photograph: Circa 1960 by Angela Jackson. Today's poem is Gentrifier by Franny Choi. Today's poem is Turtle, Swan by Mark Doty. Today's poem is Vows by Melissa Stein. Today's poem is Our Dead Friend by Alicia Suskin Ostriker. Today's poem is On Kindness by Aracelis Girmay. 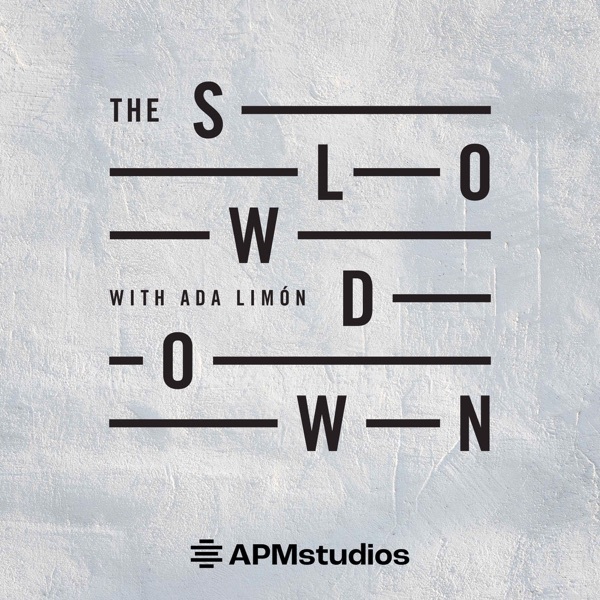 Today's poem is The Raincoat by Ada Limon. Today's poem is Against the Promise of a View by Maureen N. McLane. Today's poem is The Star Market by Marie Howe. Today's poem is A Talk with My Grandson, Age Six by Wanda Coleman. Today's poem is My Father at 49, Working the Night Shift at B&R Diesel by Edgar Kunz. Today's poem is Love (III) by George Herbert. Today's poem is 'N'em by Jericho Brown. Today's poem is Therapist 4 by Bao Phi. Today's poem is Hip-Hop Ghazal by Patricia Smith. Today's poem is Prayer on Aladdin's Lamp by Marcus Wicker. Today's poem is Woman on Cell Phone Dragging an Empty Cart Through Washington Square Park by Donna Masini. Today's poem is Spring by Arda Collins. Today's poem is Hair on Fire by Jim Daniels. Today's poem is Poetry Recitation at St. Catherine's School for Girls by Tarfia Faizullah. Today's poem is Portrait of the Alcoholic with Withdrawal by Kaveh Akbar. Sign up for our newsletter at SlowdownShow.org. Today's poem is Pentatina for Five Vowels by Campbell McGrath. Sign up for our newsletter at SlowdownShow.org.